Maggiano's Little Italy, Brunch, Lemon Ricotta Pancakes, by Annette Dixon - Village View Publications, Inc.
the Flour and Baking Powder. 2. In a medium mixing bowl, whisk together the Sugar, Egg Yolks, Lemon Zest, and Lemon Juice. 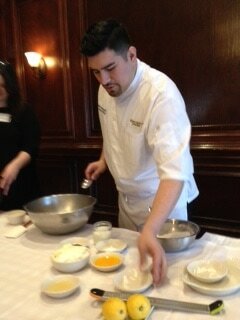 separate medium mixing bowl, whisk the Egg Whites until stiff peaks are formed. 4. Whisk the Flour Mixture into the Ricotta Cheese Mixture, until incorporated. 6, Place the Canola Oil on a 400 degree griddle. 7. Scoop the batter onto the griddle. 8. When the batter begins to bubble and the bottom has turned a golden brown. Flip the pancake over. 9. Continue to cook until golden brown. Serve The Pancakes With Whipped Cream, Blueberries, and Maple Syrup. Enjoy ! !